Search & find great entertainment and event services for your wedding on the world's largest wedding entertainment booking website. 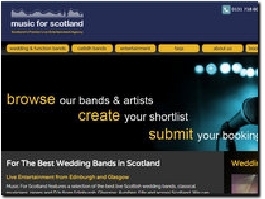 Over 3000 fantastic wedding bands, solo musicians, DJs and entertainers to choose from. Find your perfect wedding performer today! 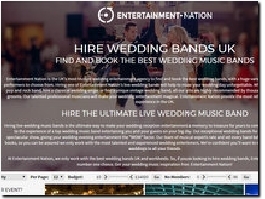 Discover your dream wedding band for hire with the UK''s most trusted wedding entertainment agency. 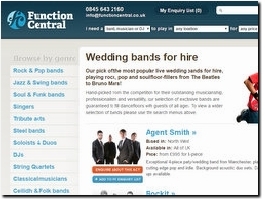 Our expert wedding entertainment advisers are on hand to help you book a wedding band from 10am to 10pm, 7 days a week! Need a wedding band to rock your party? Whatever your budget, and wherever you are in the UK, we can help. Start here with our top picks, the very best wedding bands you’ll find in the UK. Put together a shortlist on our website, and drop us a line! 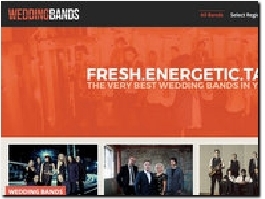 Wedding Bands is an easy to use website showcasing the very best wedding bands in London, Birmingham, Manchester and beyond. Offering a range of talented musicians’ ideal for your special day. Contact us to talk about how we can help make your day even more perfect no matter the size or the budget. Providers of after-dinner speakers to inspire, educate, motivate or entertain. Create a truly memorable wedding reception that will be remembered for a lifetime. 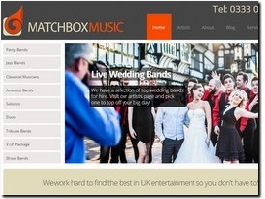 Matchbox Music Entertainment Agency representing some of the finest bands for hire across the UK. We have a concise selection of performers and make finding, viewing and booking easy! 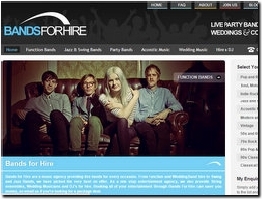 Live wedding bands in London and surrounding counties. 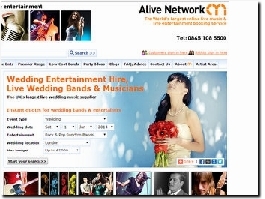 Alive Network are the UK''''s largest suppliers of live wedding bands, musicians and entertainers for weddings across the United Kingdom and abroad. Call one of our agents now for advice and to make an enquiry. 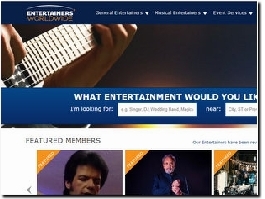 Entertaina.com is the place to book live bands, musicians, magicians and all sorts of entertainment directly. Our site is free to use, meaning you get the best possible price, saving on booking and agency fees. At the music entertainment agency we provide quality live entertainment for weddings throughout the UK at the best prices on the web. Up to 20% cheaper than booking direct. UK Music Management provides London''s very best wedding bands, musicians and speciality artistes for your special day. 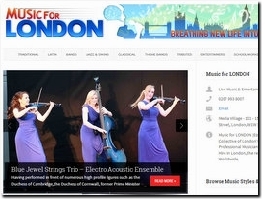 Bands, DJs and other acts available for reliable hire in London and the surrounding regions. Availability guaranteed and easy booking process. 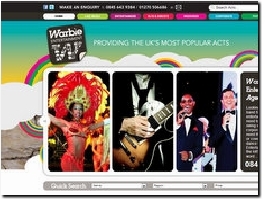 Live Bands and Wedding Entertainment in the North West and UK-Wide. Booking Agent providing solo male/female singers, live bands, duos and tribute acts. Here at Wedding Bands Wales we have the finest selection of Bands & Musical Entertainers that Wales has to offer. We specialise in Awesome Live Music Bands and entertainment. Providing quality live bands for weddings, corporate events and private functions throughout the UK at the cheapest prices on the web. A great range of entertainment from magicians to comedians and lookalikes to tributes. 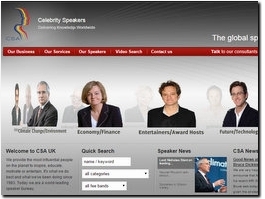 Some of the stars of Britain’s Got Talent and The X Factor are available to be booked through us. EVENING ENTERTAINMENT including:- PROFESSIONAL DJ, AND A A VARIETY OF HIGHLY-SKILLED MUSICIANS, PERFORMERS AND ENTERTAINMENT EQUIPMENT TO SUIT ALL BUDGETS. 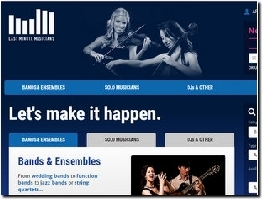 Music for Scotland are the premier live music agency based in Edinburgh, Scotland. We have picked the very best live bands, ceilidh bands, DJs and classical performers available in Edinburgh, Glasgow, Aberdeen and beyond! Hire the very best in Live Wedding Entertainment. At earcandy we believe in doing things differently, as we are not your typlical agency. We pride ourselves on providing exclusively managed acts, exceptional service and talented performers that will guarantee to make your event rock! Snowdon Entertainment aims to offer quality entertainment of various styles and budget to corporate and private clients. Their entertainers are suited for all types of establishments, from 5 star hotels,theatres , casinos, social clubs and holiday camps to more intimate private parties, weddings and celebrations. Jellyfish Music provides live music entertainment across the UK for any event, including weddings, Jewish weddings, Bar/Bat Mitzvahs, corporate functions, private parties, festivals and public events. From soloists to small orchestras, covering all styles of music, we have everything you need whether you require background or dancing music. Our friendly team will be happy to help you! Sterio Entertainments provides wedding bands and entertainment to cater for any Wedding or Function in Ayrshire, Glasgow, Edinburgh & throughout Scotland.